Phillip and Ginger Lloyd’s collection of Christmas décor includes a bit of everything – Santas, snowmen, angels, gingerbread displays and even a bathroom dedicated to the Grinch. The Lloyd’s home is being featured during Saturday’s “I’ll Be Home For Christmas” homes tour, which includes five decorated homes in the Holton area. Purchased in November 2011, the Lloyd’s home, which is located off of the old U.S. 75 highway, will include 10 decorated Christmas trees and a variety of light-up garland. “When I went to Washburn, I studied interior design, but then I turned my focus towards hair,” said Ginger, who has owned and operated Ginger Snips Salon of Beauty in Holton for almost 29 years. Besides decorating her own home, Ginger also decked out the salon for Christmas for many years. The couple began pulling out Christmas items Sept. 1. Their kitchen is filled with gingerbread men and women novelty items, as well as gingerbread home scenes, which have been given to Ginger throughout the years. Their upstairs guest room is filled with angels, and a tree and three wreaths in the couple’s bedroom are covered in brightly-colored ornaments. A large collection of Santas and snowmen are grouped under Christmas trees in the basement, as well as a collection of cookie tins. A guest bath in the basement is decorated in an electrifying green as a nod to the Grinch. “We couldn’t have done all this without help from our family and friends. We’re absolutely pleased with how everything turned out,” Ginger said, noting that they received help from Ginger’s sister, Carlene Singh; their daughter, Erin; Kegan Meister and several others. One of Ginger’s favorite decorations is a glass nativity displayed upstairs. The couple usually hosts a large family Christmas after Dec. 25 near Phillip’s birthday, which is Dec. 29. The Lloyds have six children, 21 grandchildren and one great-grandchild. Their children are Lisa and Matt Elder, Rebecca and Tim Hagler, Kelly and Curtis Farley, David and Tammy Bennett, Justin and Melissa Lloyd and Erin and Jeremiah Fox. 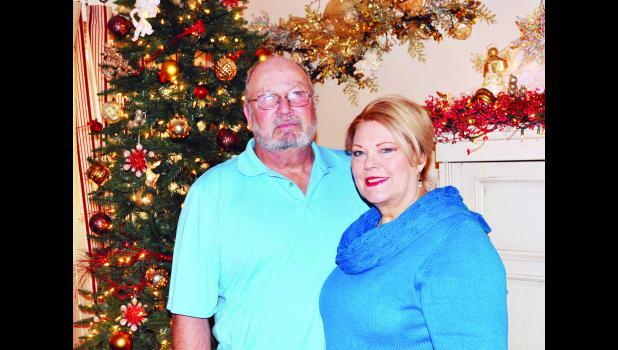 The couple likes to serve prime rib each Christmas as opposed to the traditional turkey or ham. As a gift to Ginger for all her hard work decorating, Phillip said that Gloria Stavropoulos will be catering the couple’s large family Christmas dinner this year, which is being held the weekend before the holiday. “This way we can just enjoy each other and not have to worry about anything,” said Phillip, who is a real estate appraiser with an office in Holton. Sponsored by the Holton/Jackson County Chamber of Commerce and in part by the Jackson County Tourism Council, the “I’ll Be Home For Christmas” homes tour is scheduled from 10 a.m. to 3 p.m. Saturday and include homes owned by the Lloyds, Brady and Brooke Black, Les and Rosemary Wilkerson, Brooks and Tonya Barta and Dennis and Joni White.